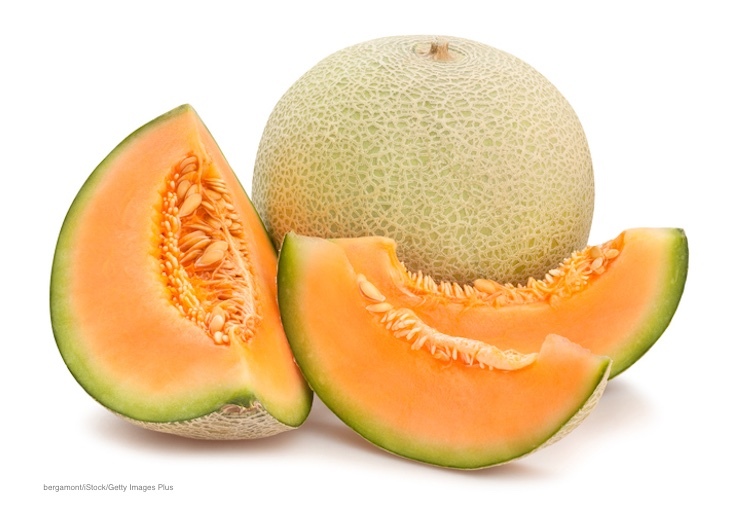 Ever since the huge and deadly Listeria monocytogenes outbreak that was linked to whole melons produced by Jensen Farms in Colorado, I have been wary of cantaloupes, honeydew, and watermelon. While I did sometimes purchase precut melons, that ended when a Salmonella outbreak linked to precut melons sickened dozens in 2018. The current Salmonella Carrau melon outbreak has increased my resolve. How do you prepare safe melons in this day and age? The problem with this fruit is that the surface of melons is the perfect space for bacteria to grab onto and hold on. Melons, especially cantaloupe, have deep crenelations and a webbed, rough surface. Bacteria love to hide in those nooks and crannies. Even worse, some pathogens can produce a biofilm that covers bacterial colonies, protecting them from cleaning attempts and even from detergent. When those melons are sliced, the pathogen can easily get onto the flesh. The issue with precut melons is that tons of the fruit is washed and sliced or cut at a large facility. One or two contaminated melons can contaminate a large batch of the fruit under those conditions and that fruit gets shipped all over the country. This is a ready-to-eat product, so the consumer doesn’t heat the melons for a kill step, and the bacteria stay alive on the fruit. So how do you prepare safe melons? These wonderful fruits should be part of a healthy diet. They are high in vitamins and fiber and low in fat and taste delicious. And if you rinse and scrub cantaloupe, keep it refrigerated, and eat it within a day or two, you will probably not get sick. But that wasn’t good enough for me. Many people sickened in food poisoning outbreaks in the past few years followed all food safety instructions and still got sick. So a study published in 2017 gave me an idea. The USDA’s AgResearch magazine published a study about using a steam cleaner to make cantaloupes safer. Scientists inoculated the fruit with E. coli, Listeria monocytogenes, and Salmonella, then refrigerated them for 7 days. A power steamer was used to steam the melons for 3 minutes. The steam was 154°F, a temperature hot enough to kill pathogens, but not hot enough to change the fruit’s texture or taste. That cleaning achieved a 99.9% reduction of pathogens on the surface of the melons. While I don’t use a steam cleaner on melons I buy, I do use heat. (I don’t use this method for watermelons unless I can find a small one.) I first rinse and scrub the melon. Then I bring a large pot of water to 160°F, then gently add the melon (watch out for splashing! ), and leave it for 3 minutes, keeping the pot on the heat and moving the fruit around using a large spoon so all parts of the melon come into contact with the water. I remove the melon using a large heavy-duty strainer, dry it, then cut the fruit. I have found that this method does not change the taste or texture of the melon. You do have to be careful with pots of hot water; use oven mitts and concentrate as your work. And it’s cumbersome moving the melon around and getting it out of the water. One more thing: this method is not a 100% guarantee that all of the bacteria that may be on the fruit will be destroyed. But I now feel confident that I can prepare safe melons and serve my family the fruit that we love so much.